Settlers of Catan. Ever heard of it? Realm is always wanting to play Settlers. He wants more board game extensions, but I don’t know why. If he can’t get players for the original game, why would he think more of the same is a good idea? This is a significant discovery because early in our marriage we had to ban Monopoly for a healthy relationship… with each other, with other couples, with our parents and siblings. Realm is terrifically competitive when Atlantic Avenue is on the line. He gets mean and calculating. Generally, we want our friends and family to visit again, but he’s not thinking about that when he’s bankrupting them with a sparkle in his eye. He’s not thinking of the short responses he is going to receive from me while I simmer over his quiet chuckle when finagling me out of my best property. Yes, I think Catan brings out the worst in us. Magne goes into power-hungry mode, and Pearl starts trading using her Batman voice. Okay, Pearl uses her Batman voice for everything lately. “Pass me the salt,” comes out much more threatening, and “the peanut butter cookies were delicious” takes on a Beetlejuice quality. Her Batman voice did not intimidate anyone out of their sheep, though. Pearl lost, Dawn won, and Realm began a campaign of assuring me it was a great game that I played well but for the slight infraction of trading in four brick for a wood when I should’ve offered him three for a trade instead. Well, my good deed of playing Settlers is done for the year. There is nothing like coming home after the holidays. I drive by the neighbors’ houses, where cardboard boxes are battling it out with the garbage cans. The once festive green garlands are trailing along the front walks like miserable, bloated snakes. I walk through my door and spot the tinsel draped across my sofa pillows, a tad passé now. The white tree lights, dangling dangerously near the forgotten mug of curdled milk left out for Santa, are not going to win any Better Homes and Gardens awards this week. The leftover party favors, the scary-looking nutcracker dolls toppled over like dominoes on the mantel, the torn edges of shiny paper littering my floors are all evidence that we were hit by the Christmas tornado. If your house is clinging to Christmas past, and you have kids at home who can read, catch up with the Company Drill. This drill is inspired by the panic that ensues when you find out—15 minutes beforehand—that your favorite Aunt Minnie will be dropping by for a visit; or when that fabulous Mrs. Hodge, the president of your homeowner’s association, who washes her car for zenith shine while most sane people are asleep, calls and asks to borrow your Rain-X. The drill focuses on getting the public areas of your house in order. This simple little paper is posted in an inconspicuous location, say, on a door inside a closet. It works best if you employ a timer—because you’re trying to clean up in record time. The goal is to straighten up in less than 15 minutes. Don’t expect a miracle. The first couple of rounds of the drill will probably fall short of that goal, but it makes a significant dent. What’s the reward for beating the clock? A cleaner house. Seriously. Just knowing you’re done in 15 minutes is pretty exhilarating. The kids have more time to play, and mom can get some writing time in! Record your best time and see if your team can beat it during the next drill. Upbeat music is a great motivator for cleaning, but I suggest not using the music during a drill. It’s more distracting, since you’re yelling “Who has the vacuum?” and such. Plus, without the music I can pretend I’m that kid on Newsies and encourage my team with “Go! Go! Go! Get the lead out of your pants!” I’m helpful that way. It’s that time of year again. Confusion is in the air! The stores are packed with jolly little pumpkin and candy cane costumes. Wicker cornucopia centerpieces dripping with blood are lined up on the shelves, waiting to adorn your festive table. I have no idea what all this is about. So, I did some research. Regarding this “Halloween” thing (I read that on a poster somewhere. I think it was between some glittery corn husks and the purple and black-striped tree skirts. ), legend has it there was a very old woman who liked to wear black, had an uncommonly warty nose, and carried a broom around—to sweep her neighbors’ front porches. She swept and she swept. Nobody noticed what a nice thing she was doing, so she became disgruntled and decided she wanted payment for her act of kindness. So, she knocked on their doors. “Hello, I need you to come out and look at your porch,” she told them. They looked, thanked her, and promptly denied her any donations for her good deed. Well! she huffed to herself; and the more she thought about it, the more it rankled. She decided she would get even. The “Hello, we need” later merged to form, “Halloween,” the rest became the brief, “Trick or treat,” and that’s how it all began. At least, that’s the gist I came away with. I’m still looking for the thanksmas part. 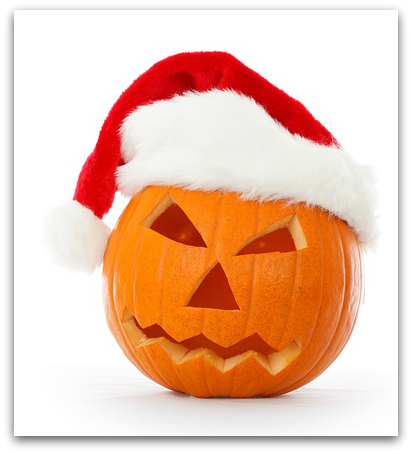 Author Rilla ZPosted on October 7, 2015 October 7, 2015 Categories Holidays and Observances5 Comments on Happy Hallothanksmas!